Moravia (Czech: Morava; German: Mähren) is a historical region in central Europe in the east of the Czech Republic, one of the former Czech lands. It takes its name from the Morava River which rises in the northwest of the region. Until 1641 Moravia's capital was the centrally-located Olomouc, but after its capture by the Swedes it moved to the larger city of Brno (Brünn) which resisted the invaders successfully. 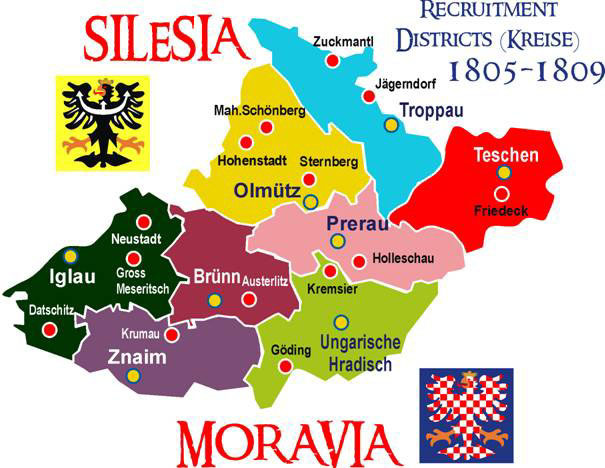 The Moravians are a Slavic ethnic group who speak various dialects of Czech. Silesia was the former Duchy of Upper and Lower Silesia (German: Herzogtum Ober- und Niederschlesien) an autonomous region of the Austrian Empire. It is also known as Austrian Silesia (German: Österreichisch Schlesien; Czech: Rakouské Slezsko; Polish: Śląsk Austriacki), and despite the official name it only included parts of Upper Silesia, while none of Lower Silesia was within its borders. It is largely coterminous with - and somehow currently identified as - the region of Czech Silesia. As part of the Kingdom of Bohemia, Silesia was inherited by the House of Habsburg in 1526 after the death of the Bohemian king, Louis II The two main cities were Teschen and Troppau (Opava). Brünn (Czech: Brno). Is the capital city of the Margravate of Moravia, a land which was administrated by Prague but having its representatives at Vienna. It was surrounded with bastions, and with a wide ditch. The most important building of the city was the parochial Church, dedicated to Saint Jakob, all covered in brass. The population was around 16000 inh., and it had 1946 houses in 1814. The town is at the confluence of the rivers Schwartschawa and Switawa and was protected (westwards) by the strong fortress of the Spielberg castle. Gross-Meseritsch (1100 inh. ), Trebitsch (3672 inh. ), Slawonitz and Stannern (a smal town in effects but renowned for an aerolite fall, the previous year 1808). Mährische Schönberg (Czech: Šumperk) founded by German colonists in 1269. The German name Schönberg means "beautiful hill", and the name Šumperk is a Czech garbling of the original German name. The town of Šumperk became the center of the area. It was located on a trade route, and the town profited from the copper mines. Its area was close to the Silesian border. Prerau or Prseron (Czech: Prerov) It was one of the oldest towns in Moravia, withs a Gothic town-hall and an old castle, once occupied by Matthias Corvinus. The Circle had not a large amount of inhabitants but some important towns like Bodenstadt or Podstata (1100 inh.) and, above all, Kremsier (Cremsier or Kromeritz) which was the summer siege (castle) of the Bishop of Olmütz and the District siege. Town of Fulnek had around 5000 inhabitants. Then were also Freyberg (Prsibor) had 261 houses and 3500 inh., Leipnik (3498 inh. ), Meseritsch (3357 inh. ), Weisskirchen (3272 inh.). Ungarische Hradische (Czech: Uherské Hradiště) was the earliest known Jewish community dated from 1592. It was founded in 1257 by the Czech king Otakar II Important towns of the Circle were: Bissenz (2477 inh. ), Hungarisch Brod (2912 inh.) and Ostrau. The surname Ungarische (hungarian) here means merely slovakian. Znaim (Czech: Znoymo) or Znaym, Znogma. A Royal town settled on the top of a rough hill over the river Thaya. It will be the final topic of the whole 1809 campaign (battle and armistice). It had 800 houses and 7000 inhabitants. Teschen (Czech: Tĕšín) also Telling (latin Tessinum), a former Principality of Albert the duke of Saxony had around 5000 inh. (600 houses). In this Circle there were many Poles and that language was mostly spoken. Teschen Circle was formed by the Principalities of Teschen and Bielitz, and the dominions of the families Freystadt, Friedeck, Deutsch-Leuther, Reichwald, Roy and Halb-Oderberg. Troppau (Czech: Opava) also Oppain (latin Oppavia or Troppavia) on the river Opa. It was the capital of the Silesian Principality and was surrounded by a tall wall. In it was an ancient castle. It had around 5000 inhabitants and more than 500 houses. Its Circle was formed by the bohemian mountain lands of Troppau, Jägerndorf and Neisse and by the dominions of the Freudenthal and Olbersdorf families. Town of Jägerndorf (Czech: Krnov fron latin Carnovia) had 4650 inh. Troppau - 3rd Hussars ArchdukeFerdinand – 8 sqns. Gaya – 3rd Uhlans Archduke Carl – 8 sqns. Ungarische Brod – 7th Hussars Liechtenstein – 8 sqns. Olmütz – 3rd artillery regiment Rouvroy – 13 comp. Olmütz – artillery Handlanger Battalion – 2 comp. Olmütz – Sappers and Miners – 2 comp. Olmütz – Pioneers – 5 comp. At the Border were 4 Cordon companies. Numbers in BOLD mean a temporary area of recruitment in order to help the main District to reach the stated strength. Recruitment: Moravia, Galicia. 1 Depot Company BrigadeBojakowski in Olmütz, Division St.Julien under Argenteau. 1 Depot Company BrigadeEgermann in Sándomierz, Division Meerveldt under Hohenlohe- Ingelfingen. - before Aspern: many sources refer it began the campaign with III Corps Hohenzollern, Division FML baron Franz von Lusignan, brig. GM Ludwig Thierry. However the “Ersters” were attached to the V Corps column marching towards Landshut and Siegenburg. At Teugen it was committed with the Reserve Corps Liechtenstein (?) forming a rear guard with the Brigade GM Thierry and 10 companies and with the Detachment Oberst Hammer, other 6 companies. In effect it had the task to maintain the link between the III Corps and the V in a dangerous central position. With the same deployment it was at Abensberg (see details after, under IR 29 Lindenau). It was involved in the unlucky Thierry affair at Offenstetten, where the regiment was almost destroyed (many prisoners). Remnants remained with III corps and the unit was reorganized shortly before Aspern. The commander Gredler died, together with 173 men, other 319 were wounded, the rests were almost all prisoners. - after Aspern and at Wagram: on June 4, the regiment, now reorganizing in two Battalions, was commanded by Oberstleutnant prince Hohenzollern. It had 1726 men, 850 of which were recruits, and it was attached to BrigadeLilienberg, Division St.Julien, III Corps. The two battalions were not in the battle, but under heavy bombardment (they lost 36 dead and 107 wounded). - after Wagram: during the Znaim battle it was with the BrigadeReinhardt, Division St.Julien, III Corps Kollowrat. Recruitment: Moravia, West Galicia-Poland. 1 Depot Company BrigadeWodniansky in Olmütz, Division St.Julien under Argenteau. 1 Depot Company BrigadeEgermann in Sándomierz, Division Meerveldt under Hohenlohe- Ingelfingen. On April 23 the regiment was the first unit, together with Archduke Charles, to cross the Danube bridge and then it was order to cover the passage. 123 men were left behind with that cover mission; also they were taken prisoner by French. The day after colonel Drechsel was promoted to generalmajor and the regiment had a new commander: colonel Johann Mayer von Heldensfeld from the General Staff. Part of the battered regiment was attached to the River Inn defense (Division Dedovich, VI Corps) : two companies (the 427 men of the training division of the officers Caspary and Siegler) with the Brigade GM comte Rudolf von Sinzendorff, the rest of the regiment in reorganization. The detachment was heavily involved during the French attack at castle Ebelsberg (9 dead and 111 wounded). Captain Heinrich von Siegler had the “Hero of Ebelsberg” mention and (1810) the Maria Theresia Cross. The 2nd Battalion was later with the Détachement oberst Ignaz von Leuthner (div. Sommariva, III Corps Kollowrat) at Urfahr (May 17), the rest of the Schröder with Division baron Philipp Vukassovich in the Brigade GM Josef von Mayer. At Linz-Urfahr they lost 7 dead, 71 wounded comprising the hero of the day, major von Marinowsky, commander of the 1st Battalion , who died the day after, and 159 taken prisoners. In the meanwhile Siegler detachment had reached Vienna with Dedovich while the rest of the regiment was with Sommariva division, BrigadeSamuel von Giffling, III corps. The Schröder units gathered together on the left Danube bank before Aspern. It did not participated at the battle. - after Aspern and at Wagram: the regiment re-united with the BrigadeGrill, Division Vukassovich, III Corps. On June 20 arrived also the Train transports of the regiment from Leipnik with 498 men. The companies now were raised to 190 men again. During the French occupation of Vienna, on May 28, died the regiment’s Owner at the age of 89 years. At Wagram the 1st and 2nd Battalions (Colonel Mayer) took place at Stammersdorf while the 3rd Battalion (now under captain Siegler) supported the Grenadiers between Breitenlee and Süssenbrunn. The losses were 11 dead, 38 wounded and 12 missing men. - after Wagram: at Znaim it took place between Brenditz and Winau with the Brigade von Giffling, Division FML von Schneller, III Corps. After the battle they lost 42 men wounded and 60 taken prisoners. Recruitment: Moravia, Galicia. 1 Depotcomp. 1 BrigadeRamberg in Znaim, Div St.Julien under Argenteau. 1 Depot comp BrigadeStarczinsky in Krakow, Division Meerveldt under Hohenlohe- Ingelfingen. - before Aspern: Division FML prince Ludwig Hohenlohe-Wartenburg-Bartenstein with the Brigade GM Josef von Grill (IV Corps Rosenberg).On April 10 it crossed the Inn at Schärding being part of the avantgarde Stutterheim, IV Corps. At Teugen it was with the BrigadeRiese, Division prince Hohenlohe- Bartenstein and at Abensberg it was in reserve under Corps direct command, while the 1st Battalion (major baron Biala) distinguished itself during the combats. The right wing of the div. Hohenlohe-Bartenstein was formed also by the “Achter” which engaged a stout resistance among the woods of Ober-Laichling, fighting as skirmishers. There fell the brave major Biala, substituted by the 2nd major Bossmann. After the retreat in Bohemia the regiment was with the Division Dedovich, BrigadeVon Grill again. - at Aspern: colonel Swinburne took provisional command of the brigade, always with Division Dedovich. Regiment losses were: 134 dead and 334 wounded. On May 24 Swinburne was promoted to generalmajor and baron Carl Fürstenwärther became the new commander. - between Aspern and Wagram: on June 14 the regiment (now under Division Rohan, IV Corps) was merged with the 1st Landwehr Battalion of major Nesselrode. The regiment now had 4 battalions. - at Wagram: with Division FML prince Victor de Rohan and Brigade GM Earl Swimburne, baron von Fürstenwärther led his 3 battalions and the 1st Landwehr Battalion Iglau (major count Nesselrode), IV Corps. It had tasks of supporting and covering the retreat, which it made in the column of IV Corps directed towards Brünn. Recruitment: Moravia, Galicia. 1 Depot Company 1 Brig, Pöck (Boeck?) in Brünn, Division St.Julien under Argenteau. 1 Depot Company BrigadeStarczinsky in Krakau, Division Meerveldt under Hohenlohe-Ingelfingen. - before Aspern: it began the campaign with the I Corps GdK count Heinrich Bellegarde first with BrigadeWacquant, div. Ulm then in the reserve corps or Brigade GM count Johann Nostitz. In March the third Battalion was sent at Lobositz with the Am Ende special corps. So the regiment remained with 1st and 2nd Battalion only. Till Aspern they did not fight. In May it was with the division FML Ludwig Vogelsang, Brigade GM baron Ferdinand Wintzingerode-Ohmfeld (later Division Fresnel) I Corps . - at Aspern: the I Corps Bellegarde formed the 2nd column. The regiment was in the Brigade Wintzingerode (under GM count Ferdinand von Wartensleben), division FML count Johann Fresnel von Hennequin in the second line. They attacked Aspern in the afternoon. Losses: 55 dead, 611 wounded with the commander De Vaux, 70 taken prisoners. Being a regiment of only two battalions they lost around 50% of their strength. Colonel Domitian De Vaux was promoted and the regiment commander became Josef Weigl von Löwenwarth. The regiment camper at Deutsch-Wagram now deployed with the brigade baron Greth (from June 1 BrigadeClary), Division Fresnel, I Corps. There arrived the 1st Hradischer Landwehr Battalion, which was attached to the regiment. On July 2 the regiment was deployed with the brigade Henneberg. - at Wagram: the BrigadeClary, Division Fresnel, I Corps was in the right wing of the second line formations. Oberst Weigl led the regiment while the battalions were under Oberstlieutenant O’Daly (1st) and Hauptmann Mazzetti then Hauptmann Koss (2nd). The regiment began to fight in the second battle day near Aderklaa. It lost 50 men dead, 105 wounded, 201 taken prisoners with the commander Weigl himself. - after Wagram: the regiment was always in the second line of the I Corps deployed from Leschna till Kukrowitz. At the Znaim battle it lost 16 men dead, 919 wounded (taking account also of the wounded at Wagram, who were trasported till Znaim) and 79 prisoners. (note the III Battalion was always with BrigadeAm Ende in Saxony). Recruitment: Moravia, Galicia. 1 Depot Company BrigadeBojakowski in Olmütz, Division St.Julien under Argenteau. 1 Depot Company Statczinsky in Krakow under Hohenlohe-Ingelfingen. Manfredini regiment remained in the ranks of the III Corps, now under Kollowrat. The third Battalion in the former Brigade GM Josef von Pfanzelter, Division baron Philipp Vukassovich, then in the avant-garde column (Avant-garde brigade GM count Carl Crenneville), the 1st and the 2nd battalions detached with their colonel brigade Timotheus von Winzian (taken prisoner by a württemberg’s chasseur à cheval, after the Urfahr battle). After the battle of Linz-Urfahr (May 17) the two battalions had the task to cover the retreat till Gallneukirchen. There the regiment lost three companies of the III Battalion , taken prisoner with the two colonels Winzian and Diemar. - at Aspern: the regiment did not take part at the battle, it was reorganizing under the provisional commander Oberstlieutenant Lass. - at Wagram: was with the BrigadeLilienberg, Division St.Julien, III Corps. The regiment defended itself in mass formation against French cavalry, losing 313 dead or wounded, 171 missing. After the battle the regiment was the reserve of the VI Corps. - after Wagram: it fought at Znaim detached to the BrigadeRheinhardt, Division St.Julien, III Corps Kollowrat between Brenditz, Kukrowitz and Winau. Recruitment: Bohemia (? ), Silesia - Moravia – Galicia. 1 Depot Company BrigadeBojakowski, Division St.Julien under Argenteau. 1 Depot Company BrigadeStarczinsky in Krakow, Division Meerveldt under Hohenlohe-Ingelfingen. - before Aspern: the regiment had these Staff officers – Carpé, colonel commander, Oschée Oberstleutnant, majors Mohr, Niessel and Bourguignon. The two additional companies of the 3rd Battalion were raised at Hohenstadt in Moravia and at Calvaria, near Wadowice in Myslenice province. There were also raised the two Kader. The regiment was assigned to the division FML baron Thomas von Brady in the Brigade GM Wenzel Buresch von Greifenbach, II Corps. On April 1 the regiment gathered all its companies for a total strength of 3719 men in 18 companies. After the battle of Eggmühl the regiment was ordered to watch the right Danube bank and to cover the evacuation of Ratisbon. It was with Brigade GM Carl von Fölseis (Division FML Franz Weber von Treuenfels) in the western part of the city together with Zettwitz regiment. The two regiments organized a firm defense between the houses and blocking the bridge but the losses were vey heavy: 34 officers and 1980 men. After the retreat it returned in the ranks of the BrigadeBuresch, II Corps but for the heavy losses practically disappeared the third Battalion . - at Aspern: still with the BrigadeBuresch, Division Brady, II Corps. After the hard battle the regiment lost 90 dead and 378 wounded. During the month of June the regiment restored its strength up to 2777 men. - at Wagram: still with the BrigadeBuresch, Division Brady, II Corps Hohenzollern. It was detached with other 3 battalions to Pillichsdorf, losing the contact with the Corps and linking only with the IV Corps. During the two days battle the regiment lost 65 men dead and 282 wounded. - after Wagram: still in the BrigadeBuresch, interim Division Buresch, II Corps with a strength of 1454 men (while other 773 men were ill in hospitals). During the battle of Znaim the regiment was deployed behind the cavalry and did not take part to the fights (two companies apart). Recruitment: Moravia, Silesia and Galicia. At beginning of war: 1 Depot Company BrigadeWodniansky in Olmütz, Division St.Julien under Argenteau. 1 Depot Company BrigadeEgermann in Sándomierz, Division Meerveldt under Hohenlohe-Ingelfingen. Before Aspern: 2. Depot Company with the VII Corps in Saxony. - before Aspern: it was in the Brigade GM Josef von Bieber, Division count Franz Saint Julien-Waldsee, III Corps. The regiment was at Teugen deployed in the village of Hausen. Losses at: Teugen-Hausen (19 dead, 12 prisoners, 173 missing), On April 21 it was in brigade with IR 38 Württemberg, under Bieber. On the late afternoon the regiment was overrun by a French cavalry charge; its losses at Eggmühl (6 dead, 14 wounded, 74 prisoners, 860 missing). After the retreat in Bohemia the regiment followed St.Julien division the third column (left wing) in the area Neumarkt-Mauthausen of the Urfahr battle, but it had no clashes there. It did not take part at the Aspern battle. - at Wagram: The regiment took parte at the defense organized by III Corps and suffered heavy losses: lost at Wagram (328 dead or wounded, 6 prisoners, 2 missing) . - after Wagram: the regiment was with the III Corps deployed from Brenditz till Winau without taking any part in the battle. Note: the 2nd Depot company distinguished itself during the defence of Sandomierz in Galicia under commando of capitän-lieutenant Laux. Recruitment: Moravia, Galicia. 1 Depot Company BrigadeRamberg in Znaim, Division St.Julien under Argenteau. 1 Depot Company BrigadeEgermann in Sándomierz, Division Meerveldt under Hohenlohe- Ingelfingen. - before Aspern: they left Znaim with a force of 4792 m. (3 battalions) with the BrigadeRiese, Division Hohenlohe Bartenstein, IV Corps Rosenberg. On April 21 the regiment was on the Schneidart Hills when the French began the advance. Being shot by enemy artillery the regiment changed its position and General Staff Lieut. Col. Quosdanovich ordered to the II Battalion (major Nennel) a counterattack. The bad news from Landshut forced the regiment to withdraw till Laichling. At Thann it was under its colonel Vettel von Lilienberg (as new brigadier under Division Sommariva, IV Corps). At Abensberg it returned under BrigadeRiese, Division Hohenlohe Bartenstein, IV Corps Rosenberg and fought at Eggmühl at the right austrian wing, under direct command of prince Ludwig Hohenlohe-Wartenburg-Bartenstein. Then the Coburger followed the Archduke Charles retreat in Bohemia meeting the Hiller’s units at Korneuburg, by May 16. There the regiment was deployed with the BrigadeGrill, Division Dedovich, VI Corps. - at Aspern: the same baron Martin von Dedovich led the 4th column during the battle of Aspern. The avantgarde of the column was the III Battalion (Oberstleutnant von Kornritter). The first Battalion (major Kolb) defended itself in square formations during the French cuirassier charge. Kornritter took the command as Vettel was wounded and during the 2nd day the command passed to major von Nennel. The regiment at Aspern lost: (423 men dead, 388 wounded, 143 prisoners, 155 missing for a total of 1109 men.) Oberstlieutenant Kornitter von Ehrenhalm died after his severe wounds. - between Aspern and Wagram: On June 4, the Coburg was reached by 4 Moravian Landwehr Battalions, of which the 1st Znaim Battalion (major Haugwitz) was attached to the regiment. On June 7 colonel Vettel von Lilienberg became a major general. The regiments command was taken by Oberst Josef von Watzel (of IR 3) and the regiment was brigaded with GM Earl of Swinburne brigade, Division FML prince Viktor Rohan, IV Corps. - at Wagram: it was in the BrigadeSwinburne, Division Rohan, IV Corps. The regiment after the battle lost 34 dead and 165 wounded; the side 1st Moravian Battalion (Znaimer) lost 28 dead, 82 wounded and 440 taken prisoners. - after Wagram: the regiment was attached to the Division FML Radetzky of VI Corps (prince Rohan had been wounded) and withdrew toward Olmütz. Recruitment: Moravia, Galicia. 1 Depot Company BrigadePöck in Brünn, Division St.Julien under Argenteau. 1 Depot Company BrigadeBicking in Lemberg, Division Meerveldt under Hohenlohe- Ingelfingen. Before the opening of the hostilities the Lindenau waited for the two companies of the third Battalion which were completed in Galicia. In their place were organized two new companies so-called “Augmentierungskompagnien”. The regiment Depotdivision (other two companies) were at Brünn in Moravia. The battalions of the Lindenau were in the Division FML Emmanuel von Schustekh (V Corps under Archduke Ludwig), and then with Division FML. prince Reuss-Plauen. The regiment’s commander, Oberst von Hammer, became generalmajor and the new colonel commander was the former Oberstleutnant Philipp Pflüger von Lindenfels. Originally the Lindenau was assigned to the bohemian III Corps, but before the invasion of Bavaria it went with the V. Marched towards Landshut arriving near Siegenburg (April 19). During the Abensberg battle the corps commander Archduke Ludwig disposed the division of FML Schustekh to the “control of the withdrawing troops”. At Abensberg the regiment lost 6 men dead, 206 wounded then prisoners and 312 prisoners. IR 1 Kaiser Franz – 6 companies, IR 29 FML Carl von Lindenau – 10 companies, Dragoons n°4 baron Franz von Levenehr – 1 ¼ sqns., ½ brigade battery (4 pieces - 6 pdr). The two units (brigades) took position linking the V Corps column and the III Corps, a delicate location for a direct strong hit there could have compromised the front splitting in two the Austrian army. Thierry was in front of Offenstetten and Hammer on the Kirchdorf hill. The command of the sector was taken by FML Schustekh and FML Lusignan of the III Corps. There Thierry was overrun by a joint attack of Bavarian and Württemberg troops, which surrounded him giving an awful defeat and surrounding also GM Hammer detachment at Kirchdorf. The remnants two battalions remained in the avant-garde Division Reuss Plauen, V Corps. On April 24 the column pointed towards Neumarkt clashing with the French vanguards. Lindenau took part to that battle losing 2 men dead and 36 wounded and taken prisoners. During the following retreat the Division Schustekh was ordered to act as the rear guard of the march to Vienna. At May 3, three companies of the 2nd Battalion took position in the Ebelsberg castle (detachment Pflüger) with the troops of the VI Corps, while the rest of the 2nd and the 1st Battalion were with the BrigadeHammer, Division and Corps Reuss-Plauen (V). The regiment lost 15 dead, 242 wounded and then prisoners and 9 missing. A renewed 3rd Battalion was attached to the autonomous Brigade (left Danube bank) oberst count Johann Ignaz Franz von Hardegg while the rest of the Schustekh division stopped its march at Krems, watching the bridge on Danube (BrigadeHammer then Rheinwaldt). - at Aspern and after: the regiment, which had now again 3 Battalions controlled the Danube area called Schwarze Laken near Nußdorf. - at Wagram: was in the BrigadePflüger, autonomous, then BrigadePflüger, Division Weissenwolf, V Corps watching the northern Danube banks. - after Wagram: The regiment fought in the Znaim battle with the Brigade Pflüger von Lindenfels, V Corps deployed between the two Thaya bridges, from the Klosterbruck till Alt-Shallersdorf (the so called Chausséebruck) together with the 5th Battalion volunteers of Vienna. The 1st Battalion under Hauptmann baron Hauer was at Brenditz, two divisions of the 2nd Battalion were in the Weingärten in front of Znaim, while the 6th division was on the right, on the road to the Weingärten. The third Battalion was split between the bridges. The regiment’s losses were all from 2nd and 3rd battalions: 22 dead, 206 wounded, 181 taken prisoners. Recruitment: Moravia, Galicia. 1 Depot Company BrigadeDu Noyer in Ung. Hradisch, Division St.Julien under Argenteau . 1 Depot Company BrigadeStarczinsky in Crakow, Division Meerveldt under Hohenlohe- Ingelfingen. - before Aspern: it was with the Brigade GM ritter Adrian Joseph Rheinwaldt von Waldegg, Division Hohenlohe-Bartenstein, IV Corps Rosenberg. Marched with the VI Corps not taking part at the Landshut clash. Participated at the clashes of Dinzling (April 19), Oberleuchling, and marginally at Eggmühl (was practically attached to the V Corps of Archduke Ludwig). After the retreat it was attached to the Division FML Henry XV prince Reuss-Plauen (interim commander of the V Corps) with its BrigadeRheinwaldt. In the battle of Ebelsberg the third Battalion (Oberstleutenant count Lamezan-Salins) distinguished itself when supported the defense at the castle. Then the first Battalion (major count Anton Kinsky) covered the retreat fighting at Asten. Having organized a so called “System of protection for the upper – Linz - and lower – Vienna – Austria” the brigade Rheinwaldt was again attached to IV Corps, with Division Dedovich and, for few time, with the rear guard of Radetzky. Its train was at the complete disposition of the BrigadeHardegg on the right Danube bank. The regiment took position at the centre (Schwanenstadt) of the left Danube bank defense and had the task to watch the Danube from Linz till Neu-Aigen, a front of 20 miles (always with the BrigadeRheinwaldt, now Division Emmanuel von Schustekh, IV Corps). During this period the regiment was split in divisions or single companies. - between Aspern and Wagram: On May 31 one company made a fake-attack against Mautern. - at Wagram: two companies (Oberlieutenant baron Scheibler) made a Streif-Kommando with some Vincent Chevaulégers and tried a night attack (4-5 July) against the Tabor island near Mauthausen. Recruitment: Moravia, Silesia, Galicia. 1 Depot Company BrigadePietsch in Troppau, Division St.Julien under Argenteau - 1 Depot Company BrigadeStarczinsky in Krakow, Division Meerveldt under Hohenlohe- Ingelfingen. - before Aspern: during mid March the three battalions (3060 men) gathered themselves under the Brigade GM Nikolaus von Kaiser, Division FML baron Franz von Lusignan, III Corps Hohenzollern. It fought at Teugen-Hausen and then (on April 20) retreated covering the Division Vukassovich beyond the Laaber on the hills of Dietenhofen. After the Abensberg battle the regiment (autonomous BrigadeKaiser) was sent behind the retreating IV Corps with orders to cover their movements. The regiment stopped at Schierling where it was attacked by the Bavarians. That battle lasted till night. During the days of the Eggmühl battle the Daun had only defensive orders and retreated with the corps to Ratisbon and then to Bohemia. In May the regiment was in the BrigadeGiffing (its commander) under the division FML Vukassovich. On May 17 the III Corps now under FML count Carl Kollowrath-Krakowsky formed several attack columns in oder to seize Linz. The 1st Column, Division marquis Hannibal Sommariva, marched from Neu-Helmonsödt till the Pöstlingberg and had ½ 2nd Battalion IR 56 with the Staff, while the 1st and the other ½ 2nd Battalion were with the Détachement Oberstlieutenant baron Georg von Süden(on Pöstlingberg). The 3rd Battalion was with the Avant-garde brigade GM count Carl Crenneville of the II Column Vukassovich (centre) marching from Gallneukirchen. The losses at the Linz-Urfahr battle were 3 men dead, 51 wounded, 112 wounded and made prisoners, 80 prisoners and 17 missing. - at Wagram: during the first day of battle the regiment was with the III Corps at Hagenbrunn with the BrigadeGrill. In the second day the Daun occupied Breitenlee. It resisted to the last French counterattacks and retreated during the incoming night. Its losses were: 26 men dead, 95 wounded, prisoners and missing 195 men. - after Wagram: after the death of Vukassovich the regiment was assigned to the BrigadeGiffing, Division Schneller, III Corps and went not in battle at Znaim. Recruitment: Moravia, Galicia. Also Bohemia (Leitomishl till 1808). 1 Depot Company BrigadeWodniansky in Olmütz, Division St.Julien under Argenteau. 1 Depot Company BrigadeStarczinsky in Krakow, Division Meerveldt under Hohenlohe- Ingelfingen . - before Aspern: the first two battalions were organized in Moravia, while the third in Galicia. The third Battalion remained under the bohemian general HQ. The regiment was in the main column of the II Corps when it seized Ratisbon. It took part at the Eggmühl battle but without strong committment. After the retreat in Bohemia the 3rd Battalion was attached to the Brigade GM Andreas von Schneller, Division comte Franz Saint Julien-Waldsee (III Corps now Kollowrat) while the other two battalions remained with Buresch under the II Corps (now Hohenzollern). - at Aspern: the Josef Colloredo Rgt. was in the 3rd Column Hohenzollern with BrigadeBuresch, Division Brady. The regiment lost 422 men in the battle (92 dead, 305 wounded and 25 missing). On June 26 the 3rd Battalion merged with the regiment. - at Wagram: Colloredo had finally 3 Battalions and 3146 men. The regiment lost 37 dead, 183 wounded, 85 taken prisoner, 247 missing. The regiment was also at Znaim with Hohenzollern. Moravians (Moravané or colloquially Moraváci in Czech) were (and are) the West Slavic inhabitants of Moravia, the easternmost part of Bohemia, also in Moravian Slovakia. They speak Moravian dialect of the Czech language and standard Czech. The state has been a state of present-day Moravians and Slovaks. The western part of Great Moravia's core (=present-day Moravia) was finally conquered by Bohemia in early 11th century and its population was “czechicized” in the 19th century. The eastern part of the core (=present-day Slovakia) was finally conquered by the Magyars (Hungarians) in the 11th-14th century and its population developed into present-day Slovaks in the 10th century. The inhabitants of the core of the state were designed as "Slovieni" (which is an old Slavic word basically meaning "Slavs" and was also used by (future) Slovenians and Slavonians at that time) or "Moravian peoples" by Slavic texts, and as "Sclavi" (i.e. Slavs), "Winidi" (i.e. Slavs), "Moravian Slavs" or "Moravians" by Latin texts. The present-day terms "Slovaks" / "Slovakia" (in Slovak: Sloveci / Slovensko) and "Slovenes" / "Slovenia" (in Slovene: Slovenci / Slovenija ) arose later from the above "Slovieni". 1) Hungarian Slovaks dwelling the northern hungarian counties of Nyitra, Trentschin, Türok, Arva, Liptau, Söhl, Bars, Hont, Gömör, Neograd etc. 2) Moravian Slovaks also called Charvatians dwelling the Moravian lowlands and hills. They were mostly in the areas of Hradisch (were they were called Ungarische – Hungarians) and partially around Brünn, Gaya, Ostrau, Lundenburg and on both banks of the river Morava (March in German – Marchland = Morava land). 3) Silesian Slovaks dwelling the northern part of Moravia being the lesser part of the Slovak gender. The Olmütz District was also inhabited by Hannaques, a people of farmers with dress, customs different from Slovaks. Their principal wealth consisted in their cattle and flocks. They probably were the most ancient slavic Moravian tribe. They lived, at the time, in an area between Olmütz, Wischau, Kremsier and Prossenitz, around 20000 square meter wide. Three small rivers (Hannah, Trzebowka and Blata) granted and extreme fecundity to the ground. Frederick II the Great of Prussia seized Silesia from the Habsburg heiress Maria Teresa in the War of the Austrian Succession (1740–48). After Prussia's victory, Austria retained only the Silesian districts of Krnov (Jägerndorf ), Opava (Troppau), and Cieszyn (Teschen), which constituted extreme south-southeastern Silesia. Austria’s Silesians (Silesian: in Polish Ślązacy; in German Schläsinger) were considered as being Poles. While the Lower Silesian language was considered a German dialect, spoken in Lower Silesia (Prussia), mainly in southwestern Poland, but as well as in northeastern Bohemia they spoke a slavic (rather polish) Silesian idiom. In every case they were considered to be part of Moravia. These districts were united to Moravia until 1849. 2) the Rusnjaks (Rusyn) (who were called also Ruthenians and came from Bielorussia) dwellers of the southern mountains (Carpathian) till the northern Hungary counties. A group among them were the Pokutiens, confined in the Carpathian mountains. All these people dwelled mainly in the Galician lands. 1st Battalion Brünn - Oberstleutnant Count Franz Chorinsky then major Count Johann Taafe. - after Wagram: with remnants of III Battalion became the I Comb. 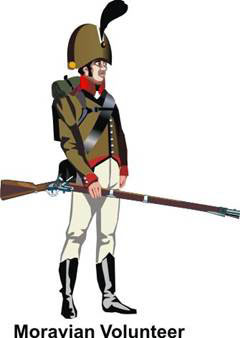 Brünner Landwehr Battalion. - after Wagram: with remnants of the I Battalion became the I Comb. 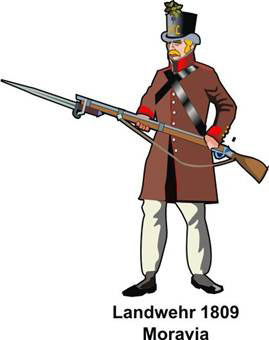 Brünner Landwehr Battalion. - after Wagram: BrigadeNeustädter, autonomous, V Corps. In August with 2 comp. of I Battalion became the II Comb. Brünner Landwehr Battalion. - after Wagram: Division Radetzky, IV Corps then in Olmütz later merged with the II Battalion in the Combined Znaymer Landwehr Battalion. - after Wagram: the Znaym Landwehr were all combined together. Magny, Franz Anton Graf, Obtl. On l March 1809, it was allowed the creation of volunteer battalions. The 1808 Landwehr Patent contained many exemptions, especially for students, skilled workers and townspeople, but they could volunteer for “Freiwillige” units, augmented by Landwehr prepared to serve outside their district. Volunteers signed up for the duration of the war. All officers and NCOs had to have military experience and so were retired or drafted regulars. The distinguishing uniform feature of all western volunteer battalions was the cuffs red. - at Aspern: BrigadeReinhardt, Division Schustekh, V Corps (never engaged). later: major Bernhard Dobler von Friedberg. - Recruitment: in the Landwehr districts II Olmütz and II Iglau. in April: 1 Battalion BrigadeBojakowsky in Olmütz, 1 BrigadePöck, Division St.Julien under Argenteau. Maybe it was only in Reserve during the action at Teugen, in which the III Corps attacked. Pizzighelli, Cajetan: Geschichte des k. k. Infanterie-Regimentes Kaiser Franz Joseph Nr. 1. 1716 - 1881. Troppau: 1881. Amon von Treuenfest, Gustav Ritter von: Geschichte des kaiserl. u. königl. kärnthnerisches Infanterie-Regimentes Feldmarschall Graf von Khevenhüller Nr. 7. Wien: 1891. Gartner Edler von Romansbrück, Anton: Geschichte des k. u. k. Infanterie-Regimentes Erzherzog Carl Stephan No. 8 von der Errichtung des Regimentes bis auf die Gegenwart. Brünn: 1892. Geschichte des k. u. k. Infanterie-Regimentes Oskar II. Friedrich, König von Schweden und Norwegen, Nr. 10. Wien: 1888. It seems extremely contradictory what affirms the history of the regiment at page 255: “the colonel and regiment commander Weigl, to whom, few time before, the wounded general major Henneberg the brigade command had assigned”. 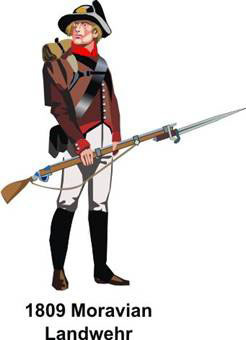 Was the regiment under Clary or Henneberg? Johann, Erzherzog: Geschichte des k. k. Linien-Infanterie-Regiments Erzherzog Wilhelm Nr. 12. Wien: 1877-80. Latterer von Lintenburg, Adolf Ritter: Geschichte des k. k. 15. Infanterie-Regiments Adolf Herzog zu Nassau. Prag: 1874. Many sources say the regiment recruitment was in Bohemia, depot Chrudim. This was the previous Kreis (1781-1800) but Wrede referred its levy was then transferred to the Moravian Silesian area with Kader at Mährische Schönberg and Myslenice. However there are some references of personal soldiers military Papers which still listed Chrudim as recruitment center for Zach’s troopers. When colonel Murray was wounded (in the Hausen woods) Bresslern had to take the command. However he was also wounded in the same battle and did not take the command of the regiment. On May 26 oberst Murray became major general and the command was given to Bresslern, who resigned on June 25 for the severe wounds. Amon von Treuenfest, Gustav Ritter von: Geschichte des k. k. Infanterie-Regimentes Nr. 20 Friedrich Wilhelm. Kronprinz des Deutschen Reiches und Kronprinz von Preussen. Wien: 1878. In the Orders of battle it can be found that the regiment had 2 battalions and 4 companies. This is correct . In effect companies n. 17 and n. 18 had been formed later and had not yet reached the regiment. Hubka von Czernczitz, Gustav Ritter: Geschichte des k. u. k. Infanterie-Regiments Graf Lacy Nr. 22 von seiner Errichtung bis zur Gegenwart. Zaza: 1902. Hödl, Rudolf Edler von: Geschichte des k. u. k. Infanterieregiments Nr. 29 Gideon Ernst Freiherr von Laudon. Temesvár: 1906. Zwiedineck-Südenhorst Hans von, “Die Brigade Thierry im Gefechte von Abensberg am 19. und 20. April 1809” . Relation Pflüger, KA., FA. 1809 Deutscliland Hauptarmee VI1/200. Joseph Mittrowsky had died on March 2, 1808 at Paskau (Moravia). Janota, Robert: Geschichte des K. und K. Infanterie-Regimentes Graf Daun Nr. 56. Teschen: 1889. Pillersdorff, A.: Das 57. Infanterie-Regiment Fürst Jablonowski und die Kriege seiner Zeit. Wien: 1857. In effect there were a bit of confusion upon the mountain people of Moravia (and Silesia). Walachians wee different from Slovaks but had a similar dialect and were also different from the Hannaques, which were rather confused with Slovaks. Walachians had other denominations, one different for each village (they were mostly shepherds): Kopaniczares, Chorobates, Passekarsches or Sallaschener. In Rohrer, Versuch über die slawischen Bewohner der österreichischen Monarchie. 1804, VolunteerI, p. 29. There is some contention over whether Silesian is a dialect or a language in its own right. Some Polish linguists consider Silesian to be merely a prominent regional dialect of Polish. However, many Silesians regard it as a separate language belonging to the West Slavic branch of Slavic languages, together with Polish and other Lechitic languages, as well as Upper and Lower Sorbian, Czech and Slovak. In July 2007 the Silesian language was recognized by the Library of Congress in USA. The 3rd Battalion was not completed, the men were attached to the 3rd Moravian volunteers Battalion .